The nights of August are clear and warm, and it is a perfect time for stargazing, as we are witnessing the Perseids – one of the most spectacular meteor showers of the year. We are always taking Budster for a walk before bed. During one such walk, he noticed the moon in the sky. Since then, he has been very partial towards it. It was his discovery, which made it very special. In all of his books, he would point to the moon in the pictures, and when he started talking, “moon” was among his first words. Imagine that! He could not ask for a drink, but he could ask for the moon. 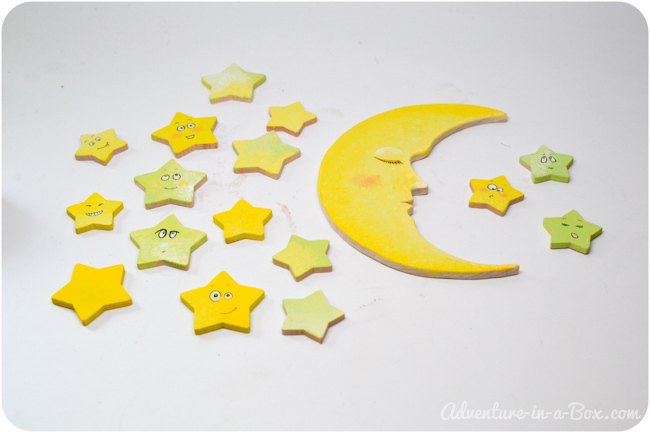 Budster’s moon and stars are made of wood – I cut the moon with a scroll saw and bought the wooden stars to accompany it. 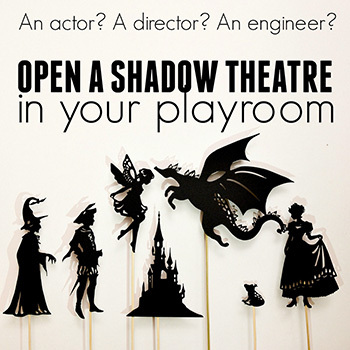 There is no reason why cardboard or even card stock cannot be used for this tutorial, though! 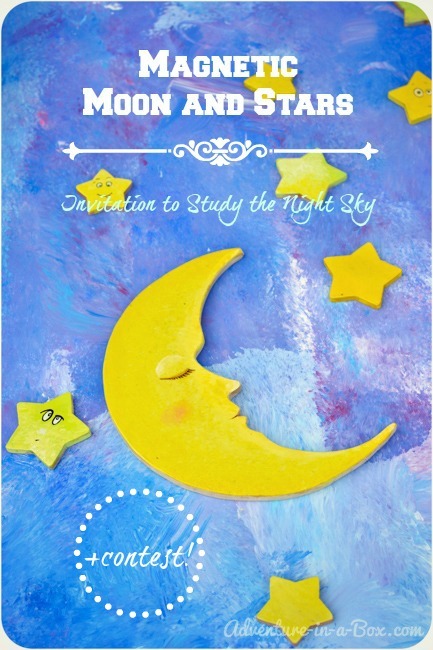 Please, use this template Moon and Stars to transfer the stars and the moon onto thick paper and cut them out. Budster is always game for painting, so I recruited him to paint the stars with a mix of green and yellow tempera. The cutouts of stars were attached to paper with double-sided tape, so that they would stay in place. 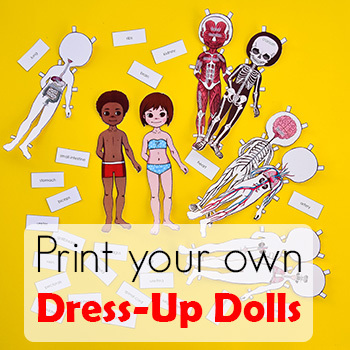 It is always exciting to make your own toys! Budster took his job very seriously. After Budster was done painting, it was my turn. I painted the moon, adding a blush and eyes to it, as if it was a delicate lady. I also added faces to some stars, thinking of additional dramatic play in the future. I used thin markers (Copic Markers are my favourite, but thin Sharpies will do the job just as well). I was not sure whether I liked the stars better with faces or not. What do you think? I ended up doing only half of them. 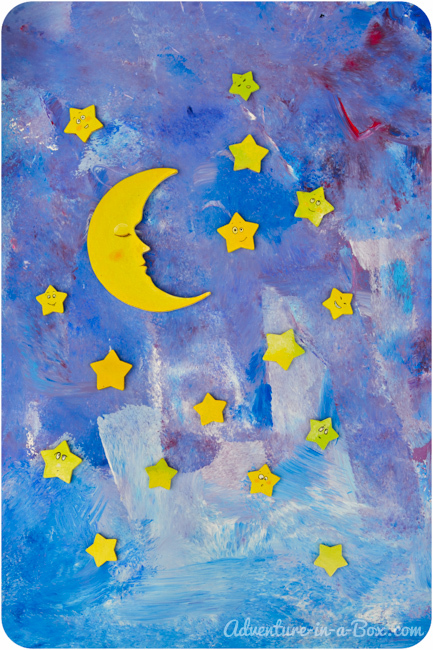 I varnished our stars and moon to prevent the paint from smearing onto wet little hands. Gouache and tempera are water-based and last better with an additional protective coat, but it is an optional step. If you use acrylic paints, this step is unnecessary. 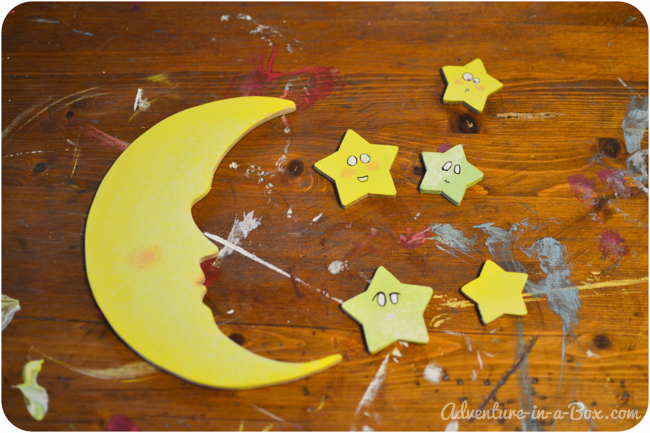 Next, I attached the magnets to the backs of the stars and the moon. Some magnets come with adhesive, but I used hot glue for attaching mine. Do you remember how last week Budster made a big space-like painting? 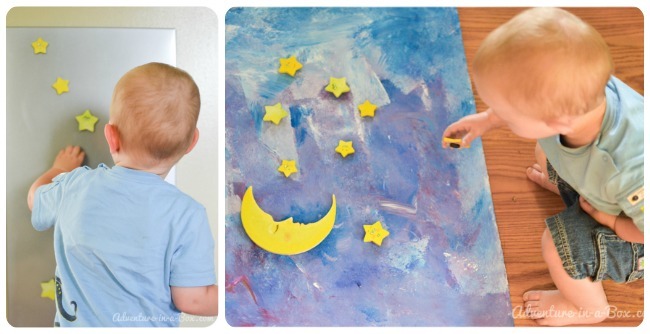 As a finishing touch for our craft, the painting became our night sky background. 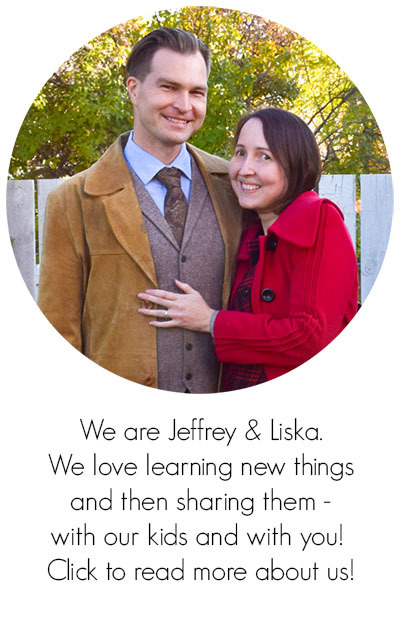 I attached it to our magnetic board. 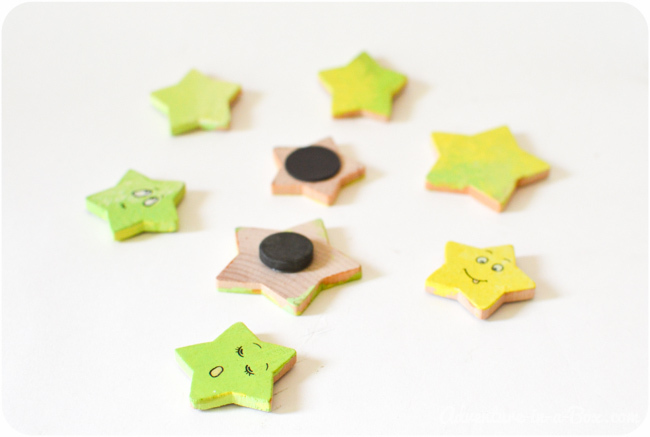 If you do not have a magnetic board, a fridge or steel door is a good place for magnet games. Budster was very happy to have his very own moon. His affection towards our cold satellite is touching. “Moon… Moonya… Moonie…” said Budster, while petting the moon. Then he took it off “the sky” and carried around with him. As for the stars, they were fun to move and arrange any way he wanted. It is also the first set of magnets that belong to him, and he can experiment with them to his heart’s content. Budster is not old enough to study astronomy on a more serious level, but in a couple of years I hope to use these magnets to introduce him to the concept of constellations. 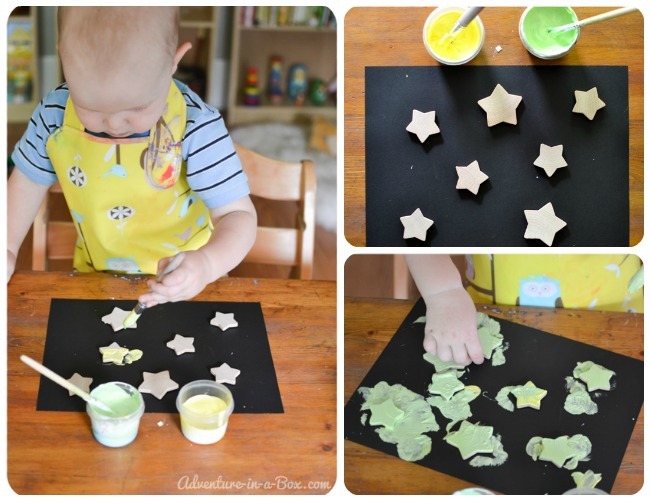 We can practice making our own constellations with star magnets, or take turns making constellations and guessing them. 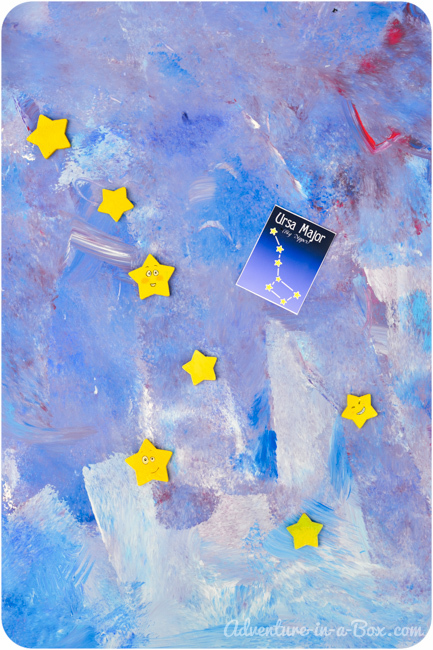 You will find beautiful constellation cards for your games over at Teach Beside Me. Would you like more inspiration? Check these links! That is such a great craft. 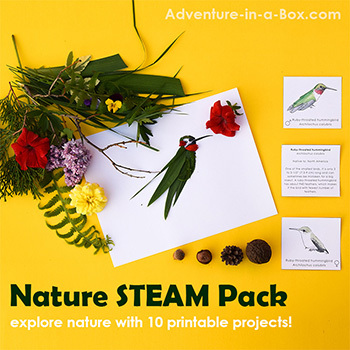 I have a feeling little Budster will grow to be so very creative and artistic…, awesome!